The big Comet sale: whole company for just £2 | What Hi-Fi? The troubled Comet chain of electrical retailers is to be sold off by its owner Kesa – for £2. Existing warranties and servicing will be safeguarded under the deal, but store closures are expected. 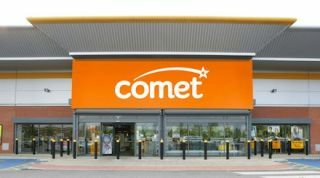 The Anglo-French company will sell Comet to a group comprising Hailey Holdings Ltd. and Hailey Acquisitions Limited, advised by OpCapita, which specialises in turning around ailing retail operations. Kesa, which owns retailers across Europe, including major French company Darty, will invest £50m into the company buying Comet, which has also attracted investment and loan facilities totalling £70m. The new owners have committed to keeping Comet as a going concern for at least 18 months, and warranties and servicing have been safeguarded with the transfer of a €73m fund from Kesa to the new company. However, it's expected that some of the 250 shops Comet currently has will be closed: plans were already underway for 17 stores to be closed, and nine more to have their size adjusted to suit trading conditions, over the next three years.